We would like to let all our friends know that Mr Tiggs is no longer with us. He passed away on the 27th march 2012. He was 11 years old and had spent all but the first 5 weeks of his life at the garden centre. He arrived at the garden centre with his brother and spent the first 3 months inside the office until they were ready to venture out into the grounds. Their names we gave them were turf and soil. they had plenty of places to have fun. The woods the tunnel were we keep the new plants in and out of the shop and office. within the first year we lost turf and hopefully he found a new home. Soil continued to take over the grounds checking out customers when they got out of their cars laying in the middle of the car park refusing to move even if a big artic lorry was pulling in an every driver would go round him. He would often be seen playing with a little mouse friend or little bird. 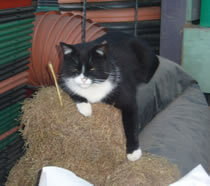 He liked to jump into cars and trucks and would often be brought back to the garden centre from a little ride out. he disappeared for a month in 2011. 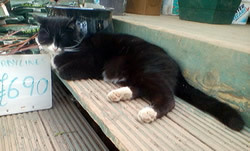 We began to think we wouldn't see him again but then we had a call from the national animal welfare trust in Watford. He was quite happily eating chicken and being fussed over. He was found at the grove hotel in Watford and was taken to the NAWT who then checked him over and contacted us to let us know where he was. They knew where he came from as when he was little we had him chipped and are so thankful as he came home. As soon as he was back he prowled round the Centre and made sure all was ok and that no other cat had moved in to take over. He would often join us for lunch enjoying our sandwiches and loved to play in the big red chair. He had lots of coy warm sleeping areas and one of his favorites was by the heater in the shop with his leg dangling down. he liked to play between the conifer trees and would often jump out at louise who looks after our plants, while she was working there. He had quite a few friends who would come and play chase, around by the soil bay and in and out of the tunnel. Another favorite of his was to have a ride in the forklift truck. When Bronson came to the yard belonging to Barnes fencing he was a bit put out but soon put bronson in his place.